Tesla just hosted its annual meeting. Here's what we learned. On Tuesday June 5th after the market close, all auto-industry eyes were focused on the live-streaming annual meeting of Tesla Inc (TSLA - Get Report) . The biggest takeaway came right off the bat: CEO Elon Musk isn't going anywhere when it comes to splitting the role of chairman and CEO. Shareholders proved their unwavering support, approving all of the board's recommendation with overwhelming support. Perhaps the second-biggest takeaway? Management still expects a dramatic operational improvement in the second half of the year. Specifically, Musk said, It's really looking like we're going to have positive GAAP net income and positive cash flow in the third and fourth quarter. Additionally, the company doesn't expect to raise capital. Finally, Musk said production of the smaller battery pack that will be used in the $35,000 version of the Model 3 should begin later this year. The hope is to begin mass production of the base Model 3 in the first quarter of 2019. The Musk we saw tonight seemed more...realistic? Somber? I can't quite pin it. 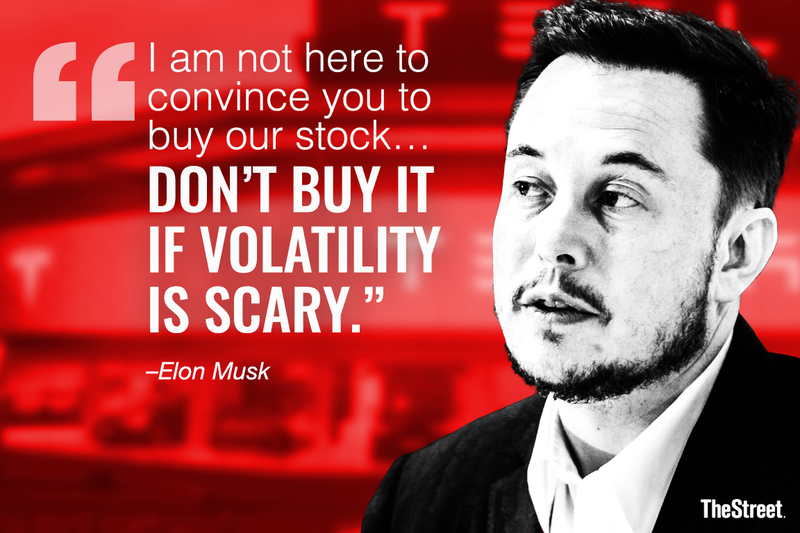 Almost like he knows Tesla has found itself with its back against the wall and it really needs to pull a rabbit out of the hat to make things work and keep its stock from tanking. He acknowledged his tendency to over-promise on the company's goals too. "I think I do have an issue with time," he said to a room of laughter, adding that it's something he's trying to get better at. Musk seemed tired, yet focused. Based on some of his answers -- testing out Autopilot last night at 1 a.m., for example -- shows that's likely the case. Plus, Musk indirectly dismissed several shareholder questions about the future by saying that the focus right now is scaling U.S. production of the Model 3. That's the company's focus and it's doing what it needs to do to get there. Musk also stressed that employee safety is of utmost importance. The automaker is currently below the industry average, which is good. But he spoke to the difficulties of growing a manufacturing operation without injuries and is still looking to cut the company's injury rate in half. So what else did Musk & Co. have to say? The company's looking to scale its energy storage business, which at the moment cannot meet demand. The goal here is to obtain gross margins similar to the company's automotive segment goals, in the 20% to 30% range. On the Gigafactory front, management seems pretty excited about starting its factory in China and plans to select a location in Europe later this year. As for the vehicles, Musk seemed pretty excited about the Model Y, but investors can shelve their hopes about seeing it this year. The unveil will come sometime in 2019 with the hope of beginning production in about two years, sometime in the first half of 2020. Musk also said the automaker is redesigning the Semi because they can get significantly more range out of it and improve the functionality. The blistering speed and impressive specs of the Roadster now appear to be the "base model," indicating that a performance version will likely come too. Not everything was perfect. Musk acknowledged that the company tried to automate too much of its Model 3 production. Specifically, they shouldn't have tried to automate tasks that were simple for humans and difficult for robots. Instead, they should have only focused on using robots for the jobs that are dangerous and difficult for humans, he explained. Further, production of the all-wheel drive Model 3 should begin later this month and hit high-volume production in September. The company is also working on bringing down the cost of ownership with the Model 3, related to repair and insurance costs, for example. Tesla plans to rollout an Autopilot update later this week, a program mired in controversy as of late. The progress here has been "very, very rapid," Musk said, adding that reliability and capability are improving quite quickly. Finally, while there may be semi trucks, cars and SUVs rolling off the line, Harley Davidson (HOG - Get Report) doesn't have to worry about a motorcycle from Tesla. After nearly dying in a collision, Musk ruled out the two-wheeled vehicle. "We're not going to do motorcycles," he said.